Many may let their healthy New Year’s resolutions – such as the common annual vows to eat healthier and maintain a steady exercise routine – fall to the wayside during their vacations. After all, a vacation is a time to relax, break from the routine, and try new and fun things. But a getaway doesn’t have to mean abandoning your healthy routine, especially on the Grand Strand. Walking and Jogging – With the 1.2-mile Myrtle Beach Boardwalk located just out the resort’s back door, taking a stroll or jog comes complete with ocean views, sea breezes and easy access to some of Myrtle Beach’s top attractions. Head just a half-mile north along the curving wooden walkway to reach the Myrtle Beach SkyWheel and Plyler Park. Venture just over a quarter-mile south to check out the Second Avenue Pier, which juts over 900 feet into the Atlantic Ocean. (Pay the pier’s $2 admission fee to take your run or walk over the water.) All along the way, the Carolina coast can be found just steps off the boardwalk, making a barefoot venture into the beaches’ white sands and easily attainable reward for all of your hard work. Biking – With newly installed bike lanes running along stretches of Ocean Boulevard, cyclists can cruise The Strip on two wheels. The southern end of the Ocean Boulevard bike lanes start at 6th Avenue North just out the resort’s front doors and run down to just past 29th Avenue South. Find more details on these bicycle lanes and more bike-accessible paths in Myrtle Beach here. Rental bikes, including road bikes and cruisers, can be procured on a daily or weekly basis at Beach Bike Shop, which is located less than a mile inland from Bay View on the Boardwalk. Fishing – At the Second Avenue Pier – which, as mentioned above, is located just off the Myrtle Beach Boardwalk about a quarter-mile south of the resort – a daily fishing pass can be purchased for just $10. All the angling supplies you’ll need to reel in a big one, including rod/reel packages and fresh bait, are available right on the pier, which is known for a wide variety of catches that includes mullet, flounder and mackerel. If your day over the water gets you feeling hungry or thirsty, the Pier House Restaurant and the Pier View Open Air Bar are located just steps away. Eating Healthy – While not-so-healthy temptations are abundant on the Myrtle Beach Boardwalk – and we promise we won’t tell if you indulge in any of the cotton candy, ice cream or other sweet treats available along the walkway – fresh seafood is also a Myrtle Beach area calling card, and plenty of nearby restaurants along the Boardwalk will serve it up with lean cooking in mind. Options include (but are certainly not limited to) the Pier House Restaurant at the Boardwalk’s southern terminus and the Pier 14 Restaurant & Lounge at the Boardwalk’s northern end. Once you’ve gotten your workout in, join us back at Bay View on the Boardwalk for some much-deserved rest and relaxation. Our comfortable accommodations, plentiful amenities and friendly service are sure to provide you with a grand getaway. 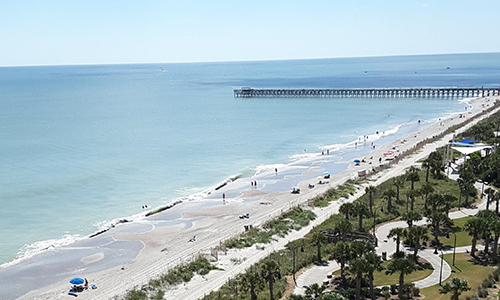 Book today – and we’ll look forward to hosting your healthy Myrtle Beach vacation soon!